Hello, I’m Francesca Snell, a proud member of the mighty Penguin Club since 2007. 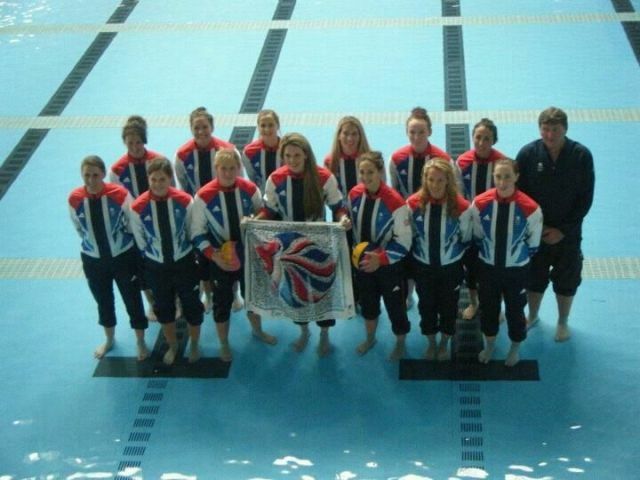 Over the next 17 month I’ll be battling for a place in the Great Britain Women’s Water Polo team to complete at the London 2012 Olympic Games, and with this blog I’ll be bringing you along for the ride! We arrived in the Athlete Village from Manchester only a few hours before the Opening Ceremony was due to start so it was a manic rush checking everything through the airport style security, getting our accreditations and finding out where we would be living. The volunteers were amazing, helping us all the way, even carrying all our luggage up to our rooms! All of Team GB were in one apartment block overlooking the Olympic Park. Our team was split into two different accommodations, eight of us in a three storey town house and five in an apartment above. My bedroom was in the town house on the first floor overlooking the Olympic Stadium – not a bad view to wake up to every morning! 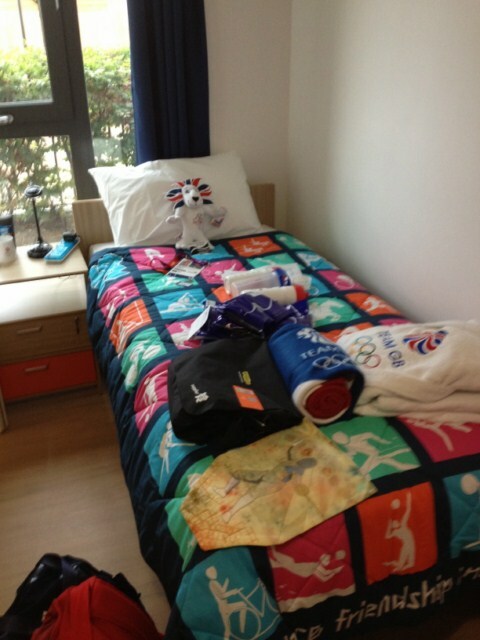 Our rooms were full of goodies: drink bottles, snacks, a teddy bear, swimming costumes, toiletries, bath robes, books, shrugs and lots more, all of which we could take when we left… including the Olympic-themed duvet! We dumped our stuff and changed into our Opening Ceremony outfits which we thought were interesting, but as soon as the whole Team GB came together they looked amazing! We walked en masse from the Olympic Village to the stadium. It took almost two hours as we were moving very slowly behind the other countries, but there was music playing and kids lining the walkway asking for photographs, signatures and chanting ‘GB’ the whole way. One of my favourite memories of the whole Olympics was waiting in the tunnel to come out into the stadium. The atmosphere was electric as we could hear the crowd roaring and we were all jumping up and down with anticipation and excitement! We were supposed to stay in lines of ten to walk out, wave to the Queen and then we could take pictures and do what we liked. But because Waterpolo was right at the back, as soon as it was our turn we all just came running out! Dancing around the track, confetti falling from the sky with 80,000 people cheering for us is something I will never forget. I won’t describe the actual ceremony because I’m sure your view from the TV was a lot better, but we had a wonderful time, dancing in the middle of the stadium and all the way back to the village. It was hard to get to sleep that night. 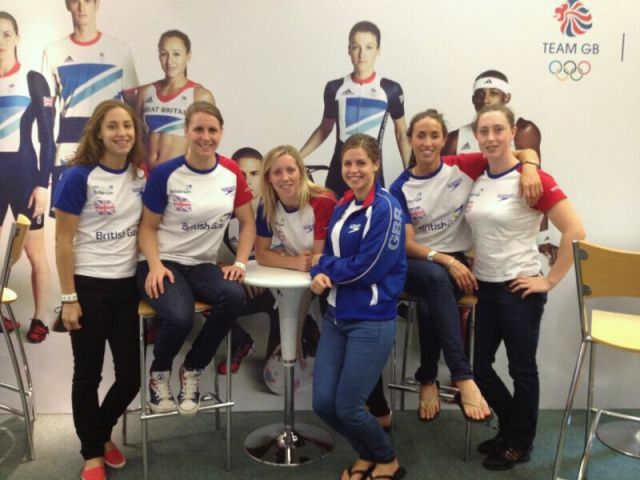 Life in the Athlete Village was incredible and I could have lived there forever! Everyone was so friendly and we all had something in common so it was easy to get chatting to people from all over the world. One of the great things was that everything in the Village was free! I went to the hairdresser, dentist and hygienist without paying a thing. You could see a doctor without waiting and there was no charge for any medication you might need. There was a non-alcoholic bar and vending machines and food stalls dotted around everywhere and you just took what you liked! The best way to eat though, was in the 24h food court. It was HUGE! You couldn’t see from one side to the other when you walked in. To cater for people from all over the world there was every type of food imaginable; Best of British, Mediterranean, Caribbean, European, American, Asian, and even a free Mcdonalds, which we didn’t touch till after we’d finished competing (although I was surprised by how many athletes were eating it every day!). I always had such difficulty at meals times becuase no matter how hard I looked, every time I returned to our table someone else had something better than me! The menu changed daily and throughout the day so you could never get bored of the food, and it was delicious. The food hall was one of the best places for celeb spotting too. 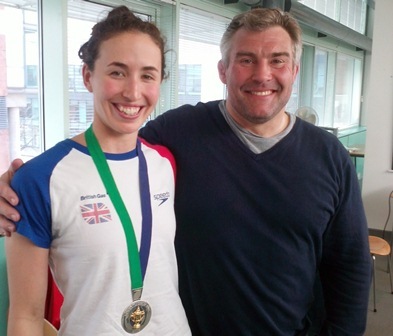 For the first few days we were a bit star-struck, living and socialising with some of the world’s top athletes. It soon became normal though to have physio next to a premiership footballer or eat your lunch next to a top tennis player. 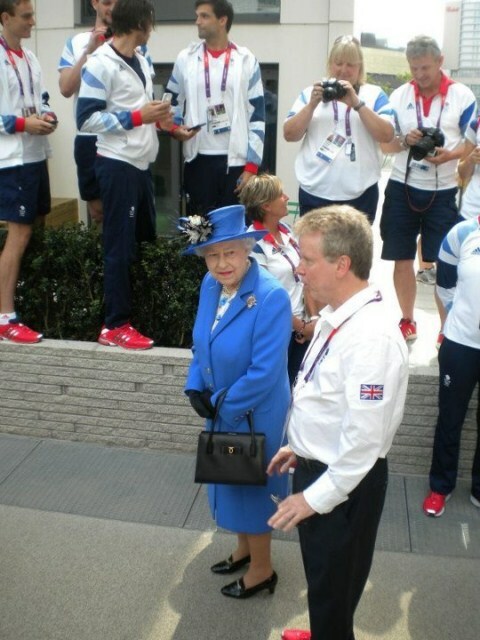 On our second day an incredibly special guest come into the Village to visit us, The Queen. She arrived in the middle of the day so many Team GB athletes were training away from the Village. She came with Prince Andrew and Princess Anne. A few girls from our team were selected to meet the Queen formally but we all greeted the royal party in the courtyard at the back of our Team GB block. Princess Anne spoke to me personally and I tried my absolute best to put on a nice English accent (I still haven’t lost my kiwi twang from growing up in New Zealand!). We also had a few other high profile visitors during the two weeks in the village: David Cameron was very friendly, chatting to us in our back yard one day. However I was gutted that I was out when Prince William, Kate and Prince Harry came into our block. Some of the girls were around and got to meet them all personally and Rosie was just in her underwear in the physio area when Kate came in and started chatting to her! Chloe was in the same situation a couple of days later when Sir Clive Woodward came in and shook her hand! After the first few days of meeting everyone for the first time and exploring the Village we soon settled into the routine of training and competing. On match days we would have an easy training session in the morning at the competition pool and on rest days we would train twice, for an hour, in the morning and evening. There were a couple of pools dotted around London that we would be driven to on the rest days or if we were lucky we would train in the onsite swimming complex in Eton Manor. This was an incredible indoor temporary facility with three 50m swimming pools, a synchro pool, a waterpolo pool and a poolside gym! 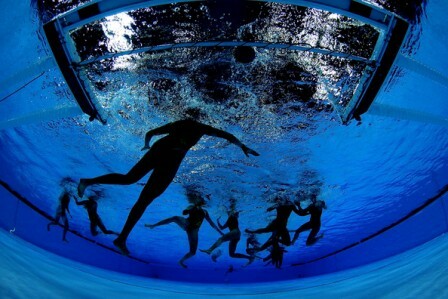 It’s such a shame this was not a permanent facility as I know London is in desperate need of more 50m pools. Our competition started on Monday 30th July against the Russians. We went into every game with the attitude that we were not going to lose. The years of training, the 6am wake up calls in the rain and snow, surviving all of Szilvester’s torrents… they were all for these two weeks. Although we were ranked 8th we believed we had enough experience and passion behind us to surprise everyone and make our Olympic dream come true. For this reason it is still painful even now, almost two months later, to think back and write about these games. This is what I meant earlier about a rollercoaster of emotions because we would go from great experiences like meeting the Queen to losing the opening game by one goal… one goal! The first week of competition continued like this… the highs of meeting our families for the first time, showing them around, discovering something new in The Village, to underperforming against the Australians and having another painfully close defeat by the Italians. Don’t get me wrong, I don’t think we were distracted, unfocused or not ready in any way, I think it was all just part of the whole Olympic experience. Despite the three loses in our opening round we actually ended up going into the Quarter Final match exactly where we wanted to be, and about to face the Spanish. The Spanish had a great first round, were on form and had won their pool yet this was the team we knew 100% that we could beat. Unlike some of the other ‘bigger’ teams, they were small and fast like us, and played a similar game. We had trained against them a lot in the build-up to the Olympics and we had been evenly matched throughout which gave us the confidence we needed. We had all known for years that this one match, the quarter final at the Olympic Games, was the most important game we would ever play. In the changing room before the game Fran, our captain, gave the a rousing speech. 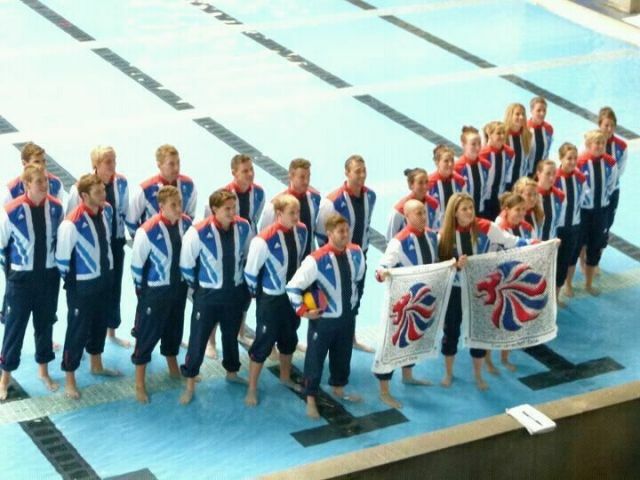 As we emerged to the deafening cheers of the GB home crowd there was no way we were going to come out of that pool defeated. I have heard athletes talking about taking it to another level for important contests, almost going into an ‘animal like’ state and this is practically how I felt. For the whole hour we were battling it out I didn’t notice the crowd or the cameras or Szilvester yelling. Were all 100% committed to what we had to do so when the final whistle blew and realisation hit that we had lost in the last minute of the game, we were absolutely distraught. That the goal that we had trained towards for years and years had been shattered in just a matter of minutes was heartbreaking – the only word I can think of that describes how we all felt in the hours afterwards. There were a lot of tears shed that night. We were given the next day off to recover both physically and emotionally which we all desperately needed. Two days later we were feeling refreshed and ready to face our old rivals, the Russians. We had lost against them by one goal three times in the last six months. Unfortunately we couldn’t continue this trend, losing to them by two goals this time in another really upsetting match. We tried really hard to pick ourselves up for the last game against the Italians as this was probably the last game our team would ever play together. The Italians’ experience and strength proved too strong for us though and we bowed out of the Olympics with an 11-7 loss. After every game we would go out to the front of the pool to chat to all our supporters, I would always walk out really upset at the loss but everyone was constantly so positive. It was frustrating being congratulated on how well we had done while feeling deeply disappointed inside, but it eventually always made a smile return to my face. That smile stayed on my face for the whole last four days of my Olympic experience. We definitely made the most of what the Village had to offer, eating as much McDonalds as we liked, getting our hair and makeup done in the salon on numerous occasions, and socialising with the other athletes who had finished competing. I don’t think I actually paid for a thing on those last few days, even when we travelled out of the Village. At night the clubs we went to let us skip the queue or cover charge, and there would be free drinks and nibbles for us everywhere we went. 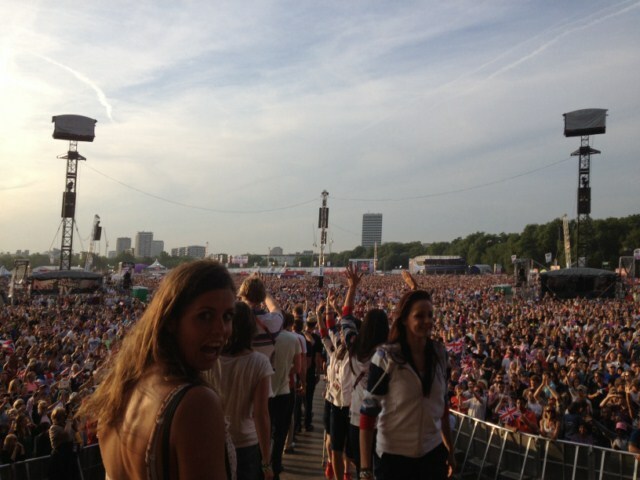 One of my favourite memories is going to the concert in Hyde Park the night before the Closing Ceremony. There was a special area exclusively for Team GB athletes and supporters but we (waterpolo and a few other Team GB athletes that were there) were invited on-stage and were presented to the 50,000-strong crowd. People were cheering and waving GB flags for as far as I could see! It was also Beckie’s birthday that day and the host got the whole audience to sing Happy Birthday to her! It was such a fantastic night. The festivities continued on to the next night too. The Closing Ceremony was so much fun. All the countries walked over to the stadium as one this time and again the atmosphere was electric as we waited to run down the steps though the crowd towards the centre of the stadium. It was great to have a front row view as some of our favourite acts performed. 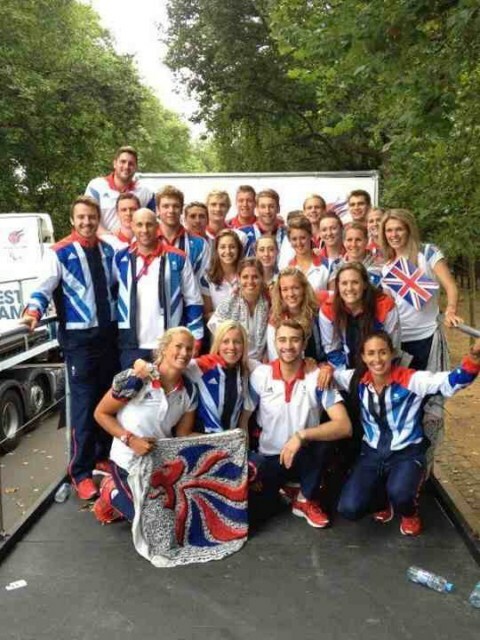 When we got back to the Village the BOA had laid on a party in the BBQ area for all the Team GB athletes. I think most of us were still there when the sun started to rise the following morning! Next day buses had been organised to take all the athletes back to whichever corner of GB they came from. It was quite funny seeing bleary-eyed people virtually crawling out of their rooms and onto the buses. I ended up getting a very nice chauffeur-driven BMW from the Village right to my doorstep in Islington and the Volunteer even insisted on carrying my excessive luggage into the house for me. My Olympic experience started and finished with one of the many thousands of incredible volunteers going the extra mile to help out. The next few weeks passed very quickly. I went on holiday with my New Zealand family who had flown over to support me. We had a much deserved team holiday at a villa in Portugal and even a quick trip to Ibiza too. But we all came back together one last time, with the Paralympians also, as ‘One Team GB’ for what was probably the best day of my life… the Athletes Parade. We all met on the morning of the parade at The Guildhall in central London and were given a lovely breakfast. We were then slowly taken out, sport by sport in alphabetical order, onto our floats. As Waterpolo we were on the very last float. The following two hours were absolutely unbelievable! We travelled at a walking pace and as far as the eye could see in all directions there were people cheering and waving. People had climbed rooftops, lamp posts, phone boxes, they were hanging out of windows and sitting on top of trucks, it was incredible! It was really nice to read all the messages of support on everyone’s posters, they were all yelling ‘well done’ and ‘thank you’ but I just wanted to yell ‘thank you’ straight back because the support we had was overwhelming! We came to the end of the journey in front of Buckingham Palace where all of Team GB gathered on the steps together for the final display. 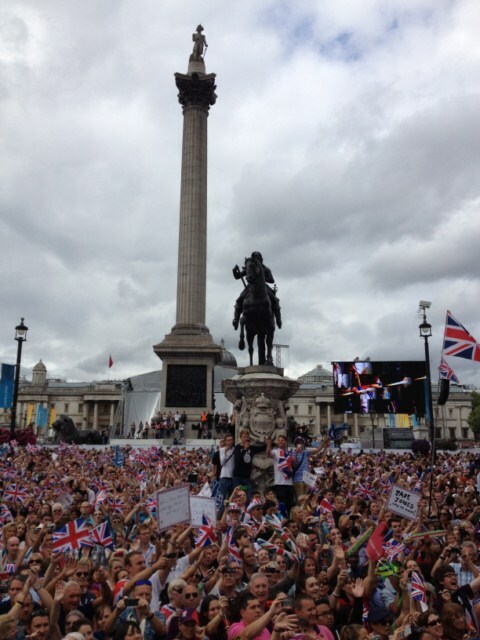 That is another amazing memory I have, standing there looking down The Mall and for as far as I could see there were people cheering and waving GB flags. This wasn’t the end of the day for us however. Straight afterwards we headed to a function centre close by for one last party! Again lovely food and alcohol were all put on for us and ‘One Team GB’ partied together for the last time. It was a perfect day to finish what had been an incredible Olympic experience! We were due to find out via email at 8am on Saturday 23rd July. At 1am that morning Chloe, Rosie and I were all still wide awake with excitement and nerves. I don’t know how we managed it but we did eventually fall asleep for a few hours, then from about 7am onwards all three of us were in Chloe’s bed waiting for the email. The last ten minutes were the worst; it took forever, and it didn’t help that Rosie was playing nerve-racking music like ‘It’s The Final Countdown’. When 8am finally did arrive anxiety quickly changed to elation as all three of us had made the team! We spent the next half hour dancing around the house in our pyjamas to ‘Celebrate Good Times’. I admit that we did also have a glass of champagne to celebrate! The hardest thing was keeping it a secret for the next two days until the official announcement at the press conference on the Monday. Both the men’s and the women’s teams were announced at the same time and this was the first opportunity we had to all come together as the Olympic Team. 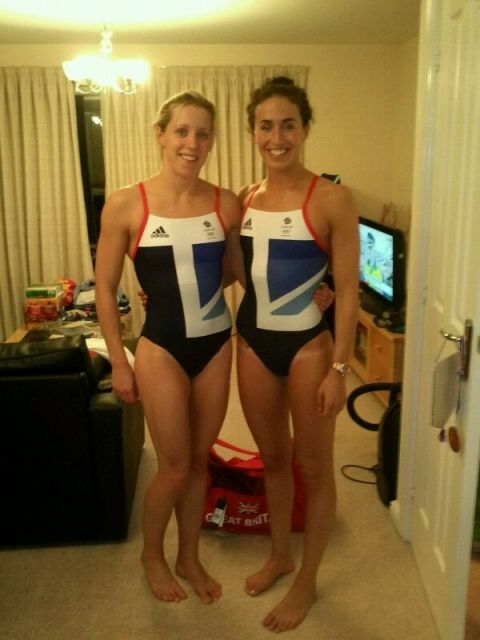 We also got to try on some of the Olympic kit for the announcement. 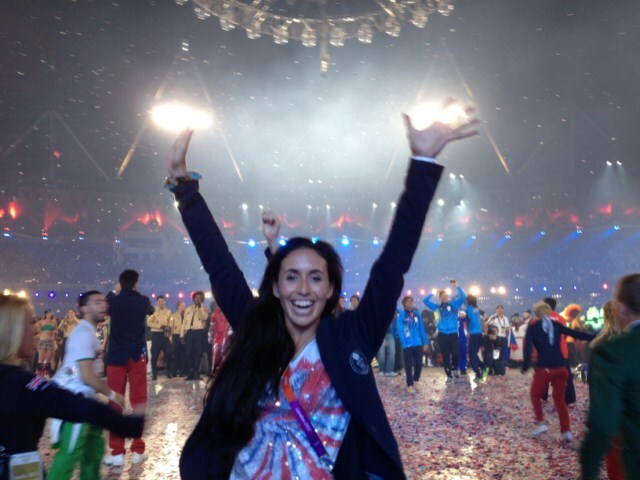 Wearing the Team GB tracksuit for the first time was incredibly exciting to say the least! After the press conference we had an afternoon of photos and media interviews. 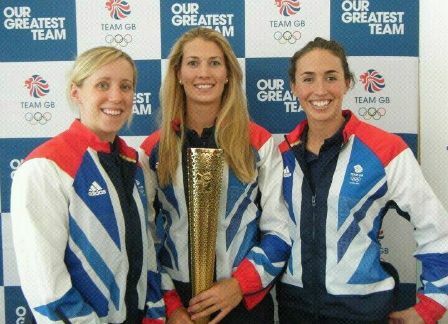 (As the only one in the girls’ team from London, I often have to do a lot of the local media stuff for London.) 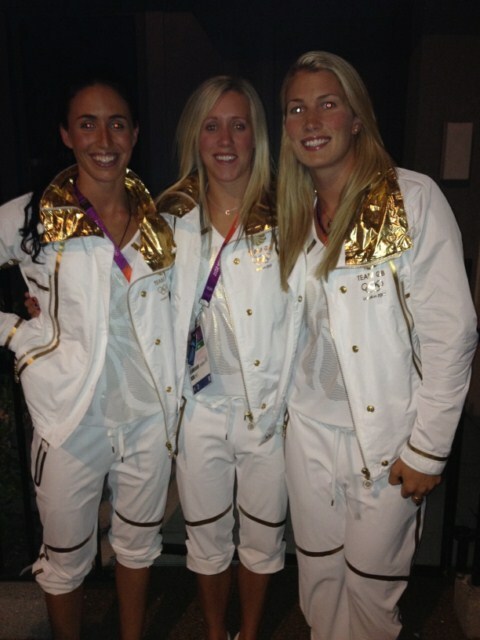 The worst part was when we had to give back the Team GB tracksuit at the end of it all. 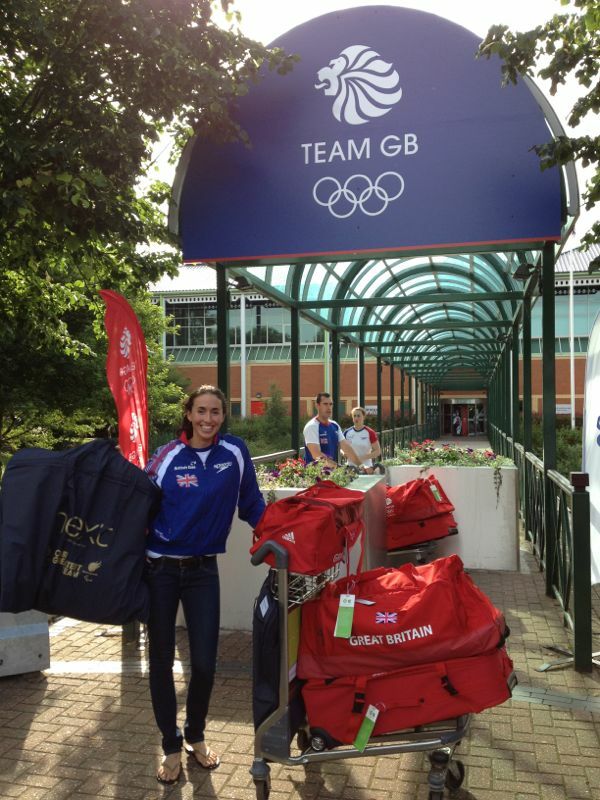 Luckily for us, though, we only had two days to wait till we headed down to Loughborough for the official ‘Kitting Out’. This has to be up there with some of the best days of my life! We travelled to Loughborough University – where the Team GB Kitting Out is based – by bus and were split into small groups upon arrival. My group first went to the ‘Ceremonies’ section where we tried on the Opening and Closing Ceremony outfits and the Formal Wear which is for when we visit Buckingham Palace apparently! All of this has been designed by Next and is top secret so you will have to wait to see what that looks like. After that we headed into the ‘Adidas’ section for the kit we’ll be wearing during the Olympics. This area was so big that we had a ‘personal shopper’ to take us round! They greeted us at the entrance and we were shown rows and rows of t-shirts, hoodies, jackets, trousers, shorts, shoes and more! It was split into different categories of ‘Village Wear’, ‘Training Wear’, ‘Competition Wear’,’Podium Wear’ and ‘Accessories’. Each athlete gets one or two of everything so tried everything on and our personal shopper kept a note of the different sizes, then it was all ready and waiting for us at the end! We also had one of our hands and feet scanned for inclusion in the Olympic Museum which is opening in 2014. With such an exciting few days it’s been very hard not to get too distracted by the hype of it all and I think it’s a good thing that we have come away for our final training. It means we can focus solely on what we have to do over the next five weeks. Also, training against Hungary and Spain is good practice for us as they are both really strong teams and we are likely to cross over with one of them at the Olympics. This will be my last blog now until after the Olympics when I will do a final post about the whole experience at the Games. We head into the Athlete Village on the morning of the Opening Ceremony. Apparently all of our games will be televised and will also be available on the internet. I know a few Penguins have managed to get tickets so I’m looking forward to hearing your support! I am back in my flat in Manchester again having just had a very busy few weeks. 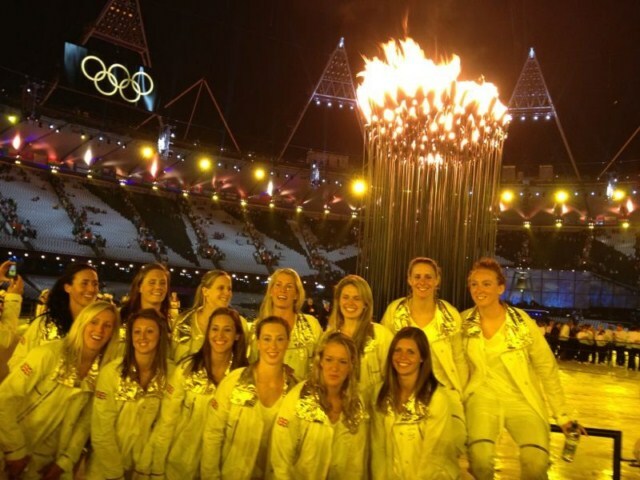 We were in London at the beginning of this month for the London Prepares event in the Olympic pool and then we headed to Greece for the World League. We played ten games in ten days and achieved some promising results. 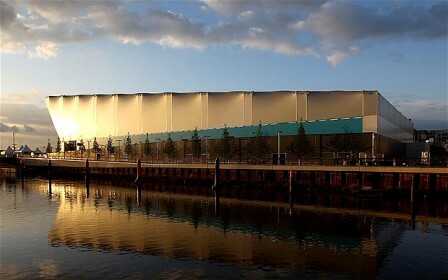 The London Prepares event was a very exciting experience. Each day we travelled by bus through the Olympic Park to the Water Polo Arena. The venue is incredible – walking in to the main pool hall on that first day gave us goose bumps! The facilities are amazing: the competition pool has the biggest grand stand I’ve ever seen, there is a huge warm up pool out the back and each team has their own meeting/changing room with showers and bathrooms. All the volunteers were fantastic too! Our first game was against Australia and despite the final result I thought we did alright. It was 6-4 going into the last quarter but the Aussies were just too strong for us and pulled away to win 10-4. It was very similar the following night against the Hungarians. We were within a few goals of them until the end when they widened the gap to win 17-10. The third evening, though, was our night! We had a nail bitingly close match against the USA (who are favourites to win the Olympics). They went 4-0 up at the beginning but we fought back to 4-3 at half time. We hung in there until the very end when we even had an opportunity to take the lead. But their experience proved too strong for us on this occasion and they held on to win 7-6. Underwater view of the game! The result against the Americans gave us a real confidence boost, although the following week was to show us that we need to learn how to win in these close games. Two days after the London Prepares event we travelled for 12 hours to Volos in Greece for the World League. In our group we had Russia (our first opponents at the Olympics). Greece (World Champions), and The Netherlands (Olympic Champions). Normally we would have played each team twice over two weekends but because of the Olympics the schedule was much tighter and we had to do it all in just one weekend. We played six games in sixty hours and it was hard work! During the first round we had painfully close results, losing all three games by only one goal! In our first match against Russia we went down early but came back and were in the lead with just over a minute to go. The Russians are ruthless, however, and they equalised then scored the winner with ten seconds left. It was a similar story against both the Greeks and the Dutch – they were ahead, then we were ahead – but we never quite managed to hang on to the end. After every game we were heartbroken as we’ve never come so close to beating these top teams and the wins were ours for the taking. During the next round our inexperience started to show and we couldn’t quite keep up with the others. We still had very competitive matches but lost all three games by four goals this time. So that was our ten games in ten days and we got excruciating near to beating some of the world’s top teams. It was a great learning experience for us and we now know what we need to work on over these last few weeks. It is also very encouraging because a year ago these teams were beating us by a lot… so we are improving very quickly! 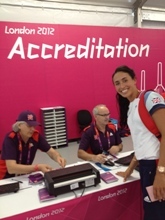 Fingers crossed… hopefully in my next blog I will be an official London 2012 team member! I am writing this month from my bedroom on a Saturday morning having just had a lovely lie in. I usually find it difficult to sleep in on the weekends after getting up for training all week, Chloe and Rosie are always telling me off for waking them up too early so I shall stay quiet in my room for a while while I type this up. Since my last blog we have been not been abroad at all, just training Monday –Friday in Manchester. Szilvester (our coach) did travel to the Olympic Qualification Tournament in Italy to watch the quarter finals, the winners of whom we will play against at the Olympics. There were some upset results too. Reigning World and Olympics Champions Greece and The Netherlands did not make it through. The top four in the end were Hungary, Russia, Italy and Spain. We are all quite pleased with that as, apart from Hungary, we have had really close results with all those teams over the last 12 months. We are hoping to do the same against Hungary next week in London. On Monday we are travelling down to the Test Event in London by bus, arriving at our hotel in the early evening. We aren’t allowed to stay in the Athlete Village yet as it is all on ‘lock down’ for security. 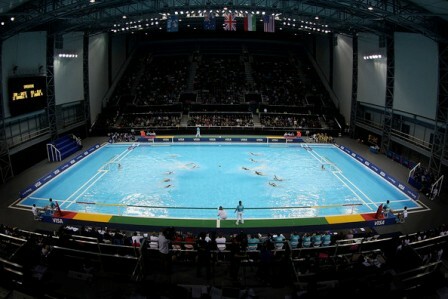 We are then spending the week training in the new Olympic pool before our first game against Australia on Thursday evening. I am really looking forward to this match, the last time we played them we were all exhausted and jet lagged in Canberra and now the tables have turned and I hope we can take them by surprise! We also have to get them back for breaking one of our players ribs while we were over there, so victory would be the best revenge! We had a very interesting talk from David Faulkner this week. He is an Olympic gold medallist from ’88 with the Men’s Hockey Team. He is also now the Performance Director of British Hockey. He had some great insights into what it will be like at the games and was encouraging us not to just focus on winning a medal but to think about we would want to feel after we’ve just played our last game, something I thought was really interesting but had not thought about before. I also had my last day at work this week. Over the last 18 months I have been working part time in the Research Office at The University of Manchester. It has been the perfect little job for me as it is just across the road from the pool, I’d always run in with dripping wet hair and stinking of chlorine, and they were happy to be flexible around my training and trips abroad. 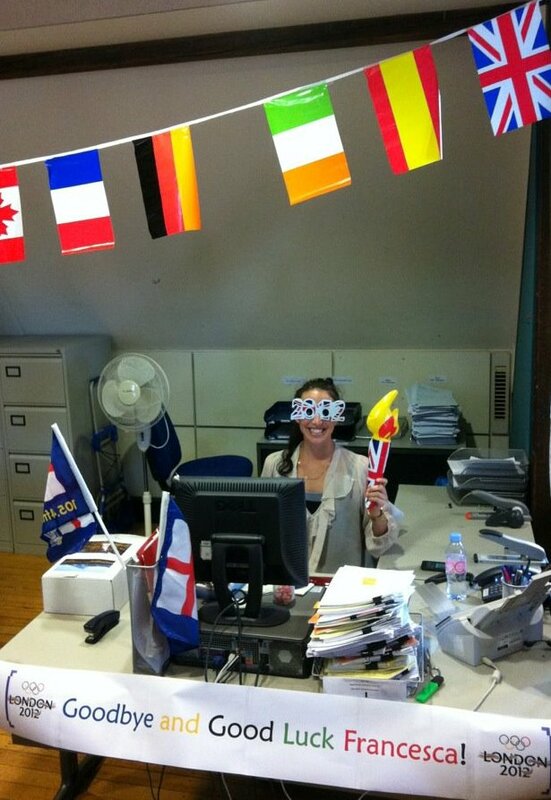 It was full of really nice people too, on my last day I walked in and they had decorated my desk in an Olympic theme! 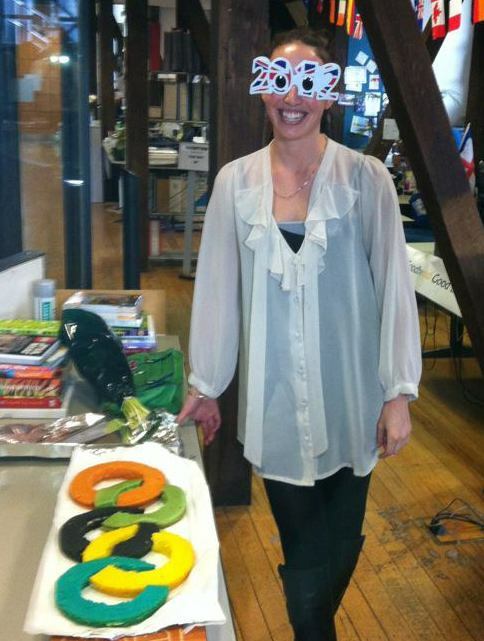 My boss had also made this incredible Olympic Rings cake. I was very sad to leave! Time now to focus solely on preparations for the next few months. We are down to London on Monday for the week and then Greece for World League on the Tuesday after that. Also, for anyone that may have looked at my empty twitter page over the last 6 months, I have decided that I am going to start tweeting pictures about these last few months leading up to and during the Olympics so have a look at that for more regular updates about how we are getting on. I am writing this month from my flat in Manchester on a particularly warm sunny day for mid March. We have a nice little garden at the back of our place and Rosie is lying out there now trying to get her first tan of the year. The clocks go forward this weekend which I am looking forward to; it is so much easier to get up in the mornings for training when it is light outside. We returned from Australia a few weeks ago and flew out to Italy only a couple of days later for the next round of the Len Champions Cup. We were split into two teams to compete in this tournament and I travelled to Recco in Northern Italy which is right on the coast and so beautiful! As in Australia we played the same day we arrived and didn’t fare too well against Pro Recco, the national Italian champions, losing 20-7. A couple of days later we had adjusted to the time difference from Australia and put up a much better fight keeping them within four goals to only lose 10-6. Since Italy we have slipped back into our normal routine of training five hours a day in Manchester. We are in the gym every morning and back to doing really hard swim sets in the pool. We have also been doing a lot of flexibility work, stretching after every session and pilates a couple of times a week. We had some fun at training yesterday experimenting with Olympic themed temporary tattoos designed and kindly donated by Lydia Leith. You can see by the photo that some of us (Lisa!) maybe had too much fun! 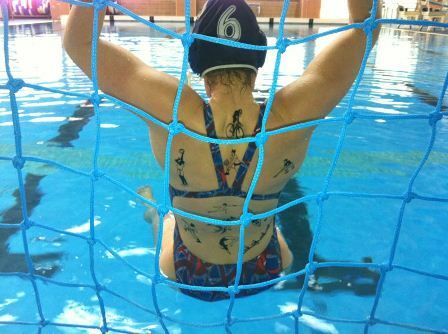 Lisa hanging in the goal with tattoos! I’m wearing his 2003 World Cup Medal. We have also had a very special visitor to training this week – World Cup winner and England’s most capped Rugby player, Jason Leonard. He came down to the pool with a couple of his mates to watch the session and then they got in and had a go. I was impressed because they weren’t bad at all, even managing to score a couple past Rosie (although we did put the floor up so they could touch the bottom!). Afterwards we had a great Q&A session with him and it was incredible to hear his stories from all the years he represented England. His knowledge of playing under pressure and in front of big crowds was so valuable in our preparation for the Olympics. It is all go now for us. We are in Manchester training for the next few weeks before we head down to London for the test event in early May and then World League in Greece straight after that. I also have my 25th birthday in a few days which is a bit scary as I know I’ll be 25 when I compete at the Olympics so now it makes it seem so much closer!